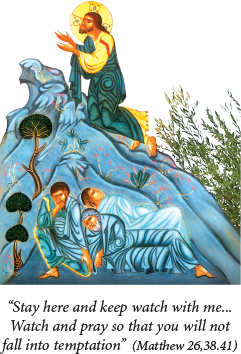 This project was born on the Mount of Olives, called Gethsemane*, in Jerusalem. It was nurtured in prayer and meditation prior to its composition by Christians in both Jerusalem and Canada. It is a devotional accompaniment proposal for the time of adoration that follows the Celebration of Holy Thursday. Once the Blessed Sacrament has been carried to some place of exposition, the Christian community traditionally meditates on the initial events of the Passion, more particularly on those fateful hours in the garden of Gethsemane when Jesus and his disciples came together for the last time. If we take to prayer on that night it is because surely we think as Blaise Pascal did: “Jesus will be in agony till the end of the world. We must not sleep at such a time”. The hour of adoration hinges on three figures of struggle and loyalty: Jesus, the Christian community and the disciples. Each scene includes a text of the Word of God, a meditation and a prayer. Moments of silence and appropriate hymn singing mark out the parts of this hour of adoration. Lastly the faithful are invited to say an Our Father and resume their adoration in silence according to the instructions of their leaders. These leaders will determine how to present these three scenes depending on considerations of time and resources available to the assembly. Should it prove necessary to privilege one or two scenes, it is recommended to always begin with the agony of Jesus and then to tie in one or the other of the scenes focusing on the community or on the disciples. Should this prayer initiative be used in some other Eucharistic adoration event, the appropriate liturgical requirements must be taken into account, more specifically the exposition and deposition of the Eucharistic Host. The texts of the Holy Scripture are taken from the New Revised Standard Version. Most of the hymns suggested here are from the Catholic Book of Worship III (CBW III), Pew Edition, Canadian Conference of Catholic Bishops, 2000. The decisive stand of Jesus holds now and till the end of time for the Church as each Christian community, each disciple, everyone in his own way paces the garden of Gethsemane to learn with the Master to surmount the trials accompanying the experience and the teaching of the Gospel, sustained in one’s watch by naked faith alone. This is the meaning of those moments experienced in fellowship: that we should also do the will of him who gives us our bread and carry on his undertaking till its full completion. It is the period of the full moon, today as it was back then. Closing our eyes we can imagine the scene… Darkness has fallen. The campfires of the throngs of pilgrims surrounding the Holy City of Jerusalem dot the rolling hills in the distance. Many have come from afar off to celebrate Passover. Beyond the Cedron streams of music resonate in the Valley. The scent and the freshness of spring hang in the air. The olive trees are all around, steadfast and silent companions, their shadows elongated in the light of a moon glowing like a great beacon afloat in the starry sky. Here the Master often has come with his followers. Nearby the grotto and the oil press, “Gethsemane”, and a bit further off the garden at the foot of the Mount of Olives. Jesus brings together his brethren here. The small group of men are faintly heard speaking and Jesus Himself, with a solemn air, whispers something. He seems to be appealing for assistance regarding some issue of much consequence. He then pulls back a short distance and I see him praying. Since the Last Supper he has appeared strange, an air on his face seemingly anticipating some tragic turn of events. So much I can see in the Master’s demeanor and his distressed features. He then gets up and goes once again to speak to his brothers, only to return shortly to his prayer in solitude. As always, his bearing by itself speaks volumes. Never have I seen so much fear in his eyes. How I would like to go to him bringing some solace, but I feel so wanting and so powerless to do any such thing. I hear him praying to the Father. He speaks of the removing of a bitter cup. But he decides to remain faithful to the Father and to do his will to the end! Now has surely come the time of which he has often times alluded over the last few months: the Hour of the Passion! And so the City is astir, like a disturbed hornet’s nest! A murderous intent is in the air carried by the resolve of getting rid of Jesus once and for all. I see him suffering. Dark tears stream down his face, beads of sweat drop from his brow… And now blood! My tears mix with yours: “Lord, spare me the sight of your suffering! No, Lord!” I feel so intensely how dear you hold our lives! I understand your struggle. And You, the peace-loving Lamb, tell me: “Let things be, so much must come to pass, for me and for all”. I feel that you do not want to leave us behind… but that you must undertake this “passage” to conquer Evil. From the love on your suffering face I know that a mystic exchange is unfolding that means: “Give me your death, take my life”. Lord, here, in Gethsemane, you join in the suffering of every human being; here, you offer yourself in your most profound humanity; here, in absolute silence, You are the Word promised by the Father. Be our salvation. Lord, help us to enter in the deep mystery of that Love capable of loving beyond all wrong. Only united to You, Lord, can we overcome all trial and unite our “yes” to yours to draw from all evil an even greater good. Amen. SONG/HYMN: Ubi Caritas, CBW III, 67 or Be with Me, Lord, 357; O Lord, Hear my Prayer, 491; Jesus the Lord, 432; Be not Afraid (psalm 22) 481; Into your hands, O Lord 70 (psalm 31). As Jesus discovered in the garden of Gethsemane all his disciples asleep and overcome with fear, he finds today communities weighed down by contradiction. Yet he remains near. The light of his presence denounces the errors of judgement and the warped views that over time harden into illegitimate values and unsound principles. Such is the stuff of that smugness and willful lethargy of the Church in Laodicea and that Jesus, the faithful witness, exposes outright. How can a community have gone so far astray as to forget where lie its real treasure and its personal and public identity, its true spiritual health and happiness? Jesus never ceases to watch over this Church. He calls out to her by denouncing its fabricated landmarks and spurious conclusions. The confrontation is biting: “You do not realize that you are wretched, pitiable, poor and naked!” The unflagging presence of Jesus is a test of souls. He stands at the door and he knocks. Will there be anyone in this Church who is capable of staying awake to hear his voice and open the door? Jesus, you, the ever loyal and tried witness, you stand at the door of our community carrying the gift of your compassion. You invite us tirelessly to conversion. Jesus, teach us to surrender our lives to the conquering truth of the Word and remain unwavering in vigilant prayer so as to not come into the time of trial. May we stand with You as a Yes to God. Amen. O my People, turn to me, CBC III, 623; or God of Day, God of Darkness, 477; As the Name of Jesus, 427; No Greater Love, 599; We who once were Dead, 402. My friends, if anyone is detected in a transgression, you who have received the Spirit should restore such a one in a spirit of gentleness. Take care that you yourselves are not tempted. Bear one another’s burdens, and in this way you will fulfill the law of Christ. For if those who are nothing think they are something, they deceive themselves. All must test their own work; then that work, rather than their neighbour’s work, will become a cause for pride. For all must carry their own loads…Do not be deceived; God is not mocked, for you reap whatever you sow. If you sow to your own flesh, you will reap corruption from the flesh; but if you sow to the Spirit, you will reap eternal life from the Spirit. So let us not grow weary in doing what is right, for we will reap at harvest time, if we do not give up. So then, whenever we have an opportunity let us work for the good of all, and especially for those of the family of faith. Christians and non-Christians alike experience trial and suffering. But as followers of Jesus, we find a treasure when falling on difficult times. When we strive to totally live God’s will, no matter the consequences, it is then that Jesus transforms our affliction into fulfillment. This transformation is unique to each person. If seldom taking away the pain of a particular trial, this dramatic change heralds nonetheless something beyond our distress: an experience of deep freedom and consolation that comes from encountering Jesus Christ in our difficulty. By offering up our suffering to Jesus our suffering is made one with his own. God enters so to speak our pain and our troubles to transform these into an experience of fulfillment and joy. How is this made to happen? How do we come to suffer with Jesus and how does Jesus come to suffer with us? Everything hangs on our Yes. Jesus is offering each of you here tonight the opportunity of assenting to a deeper relationship with Him – a relationship where you surrender to him your hurt… along with your dreams. You consent to having Jesus work in all areas of your life and depths of your being. Talk to him. Hand over your despair. Invite his healing grace into your deepest wound. Jesus came to bring new life to each and every person. He invites us to draw closer to get to know him better with each passing day. He asks our permission to enter our lives. He comes to transform our struggle. Of course this intimacy with Christ is not a rejection of community. Christians stand as a fellowship in Christ since they are called to “bear one another’s burdens” and this includes not shrinking from asking help for themselves in times of trouble. Christians are not to be oblivious to the suffering of their brothers and sisters and never be lazy or slow in reaching out to those in need. Christians have the opportunity and indeed the responsibility to reach out to people with inadequate means to live comfortably or who may be otherwise struggling spiritually because wanting in the knowledge of God’s love, mercy and intimacy that is freely available to all. Jesus, I am here tonight for you; I give you permission to enter my life right now. I give you my deepest struggle. Come and reveal yourself in a new way to me tonight. I give you permission, Jesus, to transform me; transform my difficulty into joy. Fill me with true joy. I give you permission - come Lord Jesus; I invite you into my life Amen. Let us now resume this evening of adoration in silence.